We enjoy drawing house plans and hope that we may assist in your first step of new home construction. Our specialty is drawing your plans to your design. We can help turn the home of your dreams into reality. We can work with ideas from sketches/pictures/faxes/e-mails, and personal conversations. 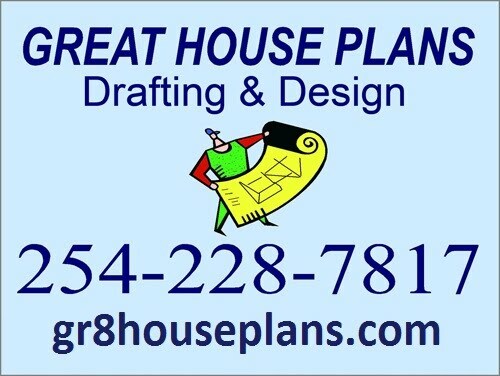 GREAT HOUSE PLANS will make every effort to make you glad you chose us for your project. We also have plans in our catalog that you may be interested in. You may purchase one of them as they appear or we can modify it to meet your needs- tastes. Just contact us for pricing info. We also provide remodeling drawing services. Services include measuring existing structures and providing new drawings (including 3D). We also draw "light commercial" and metal buildings. Any way you look at it, we are ready to meet your design needs! Go to the Contact Us tab for further info. We will work with any builder that you chose or we can recommend one that is suited to your particular project. We can also help you find land to build on. We invite developers and builders to inquire about using our services, we may be able to save you time and $$. Our 3D service offers a realistic view of the finished project. Sometimes it is possible to put the structure into a photo of the existing building site.